Categories: BAS/BMS, Building Owners, Contractors, Contractors News, Meters/Sensors, Meters/Sensors News. Keywords: Meters, Panoramic Power, Reviews, Submetering. Panoramic Power’s Enterprise Energy Management Platform is a non-intrusive, scalable, device level energy management solution that combines self-powered, wireless sensor technology with a cloud based analytics platform. The solution generates alerts and reports in real-time, providing detailed analysis of energy consumption at the asset level. With granular, load-level real-time energy data, enterprises can optimize their infrastructure and behavior and realize significant savings on energy and operational costs. Data can be read in by file imports and API calls. Direct communicating devices are based on a proprietary technology using self powered CT/Meter sensors in one transmitting using 915 MHz (unlicensed frequency) to a collector that pushes the data via cell to the cloud database. Although system is primarily geared to electricity, the system will support other utility types and various operational parameters as part of the reporting and alarming process. The company also has a power meter which enables the metering of power, voltage, current, power factor and power quality measurement data. The dashboard provides a detailed snapshot of the energy consumption at single or multiple sites. The dashboard displays the total historical, current and projected energy consumption over the entire monitored sites. It also provides managers with a quick-glance view of energy consumption breakdown and provides energy and facility managers with detailed energy and operational information. Dashboards are updated based on the frequency of data coming in the system. There are some basic dashboard applications for review and optional tailored dashboard that can be provided upon request. Some standard dashboards (maps and performance screens) allow for stepping down and up the metering assets. 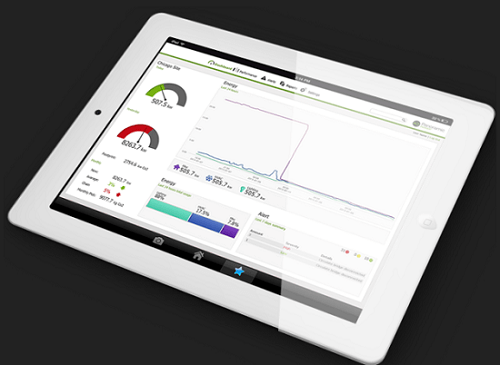 Tailored dashboards can be provided for specific applications. Consumption – Allow users to view consumption data per specific site and specific circuits over time and correlate it with ambient or outside temperature. Heat Map – Display energy usage as a “heat” intensity map, enhancing user’s abilities to instantly detect exceptional energy consumption. Data Normalization – Normalize energy consumption by weather and other site specific parameters to compare efficiencies between sites and systems. [In addition normalization can be done by the Panoramic Power Index and to other industry standards. The solution includes canned reports based on best practices, as well as customized reports that can be provided for specific applications. Users can easily create sophisticated, rules-based events and alerts in order to automate and improve everyday processes. Events and alerts can be triggered by energy pattern, status and/or threshold changes. Multiple types of predefined alerts can be triggered when a threshold change, or a combination of threshold and temperature changes, is met. Alerts can be sent to customers via, SMS, Emails or HTTP post notifications. SaaS platform operating across tablets and phones as well. With proprietary hardware and configuration simplicity, initial installation and uptime is very quick and cost effective. Direct read of meters using only Panoramic meter sensors for electricity. Therefore non-electric energy parameters must rely on 3rd party technologies to provide the data. Does not support any open protocols such as BACNET, Modbus and Zigbee.